Took the swingarm off my DRZ to do some maintenance and found the chain had worn through the slider underneath the arm closest to the counter sprocket. And also into and just through the aluminium itself. 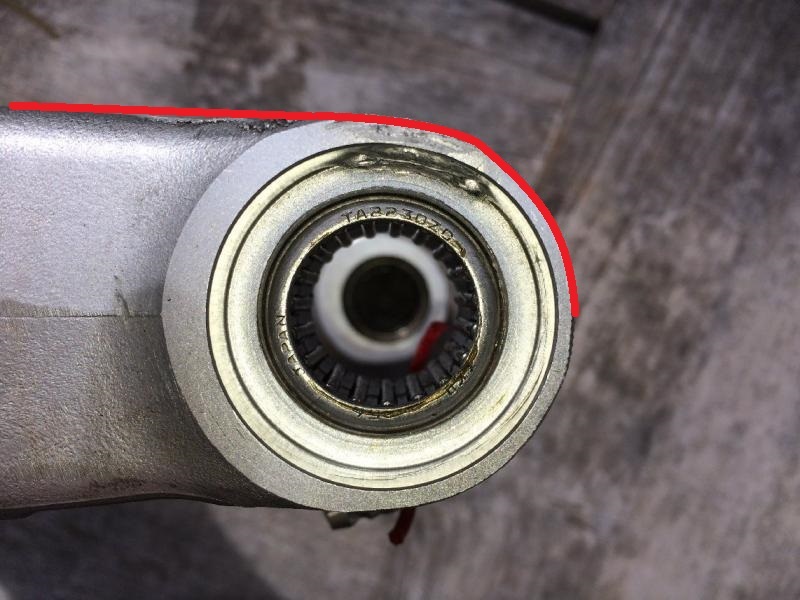 The bearing seems ok but can't be pulled because of the 'bubble' of aluminium in front of it where the chain has rubbed through. The pics will show it better. Does anyone know of a good welder who can help with this in Cape Town? I saw the guy on remotemoto had the same problem and he did an excellent fix on it so I'm hoping it can be rescued. I'm in Claremont/Newlands. I did a mod on a mates old KTM504 many moons ago when it did someting similar. Carefully filed the offending bits off, sealed up the holes using Praley Steel putty, made sure to smooth it off very neatly on the inside so the bearing could be removed if needed, got a square piece of Teflon from Maizey Plastics and made a "slider" that ran down about 150mm towards the rear of the swingarm, and had a curve about halfway around the bearing support. It was about 10mm thick, and he still rode the 504 for a few yaers after that before he sold it. Slider was still lekker. Thanks man, that is exactly what i was thinking of doing but wasn't sure if Pratley Steel would work well enough. Turns out alu welding is insanely expensive, especially once you factor in the cost of the machining they have to do afterwards. Bearings are fine and all the washers fit perfectly as it is now, it's just the seal that is very slightly off so I'll get it sorted next time it's off the bike, just got a few dry weather rides to do Struggled to find an aftermarket slider that fits so I heated and bent some 3mm Polypropylene (or Polyethylene, can't remember which) round the curve of the arm and used the old slider to hold it in place. I was sceptical but it actually looks like it'll work well.